Meet Mazie Phillips: big-hearted and bawdy, she’s the truth-telling proprietress of The Venice, the famed New York City movie theater. It’s the Jazz Age, with romance and booze aplenty–even when Prohibition kicks in–and Mazie never turns down a night on the town. But her high spirits mask a childhood rooted in poverty, and her diary, always close at hand, holds her dearest secrets. When the Great Depression hits, Mazie’s life is on the brink of transformation. Addicts and bums roam the Bowery; homelessness is rampant. If Mazie won’t help them, then who? When she opens the doors of The Venice to those in need, this ticket taking, fun-time girl becomes the beating heart of the Lower East Side, and in defining one neighborhood helps define the city. This book was passed along to me by my mom after she had finished reading it. We’re both fond of the 1920s and generally share the same aesthetic when it comes to historical fiction. 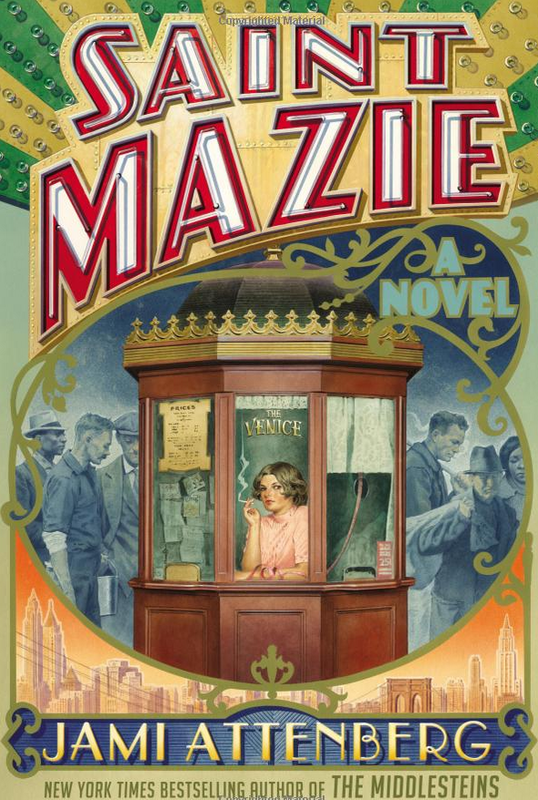 I know we’re told not to “judge a book by its cover”, but it’s hard to deny that the cover of Saint Mazie is both beautiful and eye-catching! And the tantalizing blurb is just sugar on top. I loved the idea of taking a recovered journal and turning it into a novel, as Jami Attenberg has done. Although you do question, throughout reading the book, if some of passages are real or fabricated. There’s nothing necessarily wrong with that, simply a natural curiosity. For instance, the interview-like sections of the book often refer to the interviewer, which we assume to be Jami Attenberg, but come to find that perhaps Jami created a unseen character to which these interviewees speak(?) That technique in itself is interesting, if not a little disorienting. Back to Mazie herself. She’s a great character; a streak of fire who acts and speaks as she wishes, yet at times she is distanced or guarded from us–perhaps because we are only inherently getting one piece of the larger story with the book being written in a diary format. This tunnel vision effect is corrected a bit by the outside interviews with people who knew Mazie, or from experts/authorities on the time period. Yet I still got the sense that there were large chunks left out of Mazie’s life and emotional state, perhaps ultimately adding to her overall enigmatic persona (it seems she was often perceived by others with an aura of mystique and awe)…I was left never really feeling I’d gotten a firm handle on who she truly was or what she truly wanted, although we do get glimpses (i.e. her friendship with the young nun Sister T, her instinctual and selfless reaction after the bombing at Wall Street). Fragmentation aside, what I enjoyed most about Saint Mazie was that it really evoked the snappy, unique prose style of writers of the 1920s: Hemingway, Fitzgerald (F. Scott and Zelda), etc. This style really contributed to and fleshed out the sense of the time period. I’m always a fan of books based in the 1920s. This one has been in my cart, out of my cart. I’m thinking it’ll have to go back into the cart. Thank you for the review!! less than a week after you posted this, my grandmother happened to check it out of the library! so i’ll be going through it as soon as she is finished!